Given that making a single channel system which meets GSM specifications is sufficient a challenge in itself, the approach favoured was a dual-channel platform comprised of two completely independant transceivers — rather than two carriers with one transceiver and DSP tuning. At the present time UmTRX is the only truly dual-channel transceiver that is fully compatible with the Osmocom GSM stack. 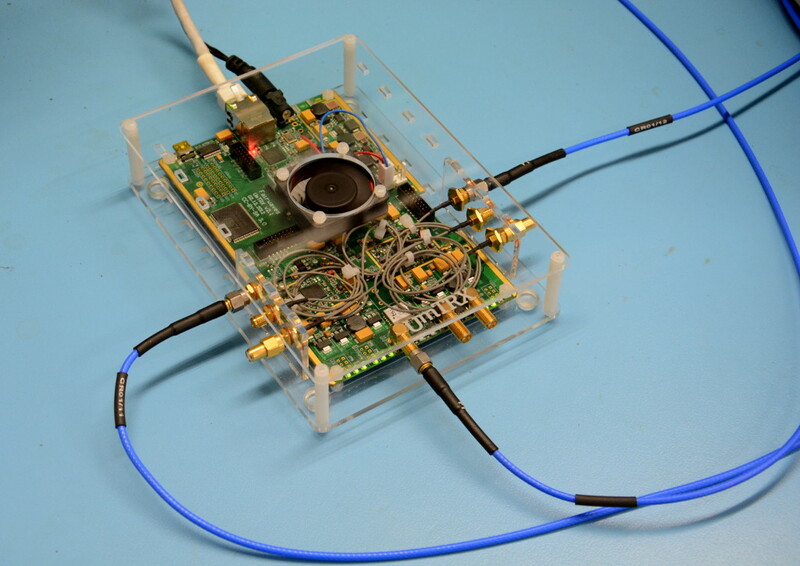 There are some platforms which offer the ability to support two carriers with a single radio, but these are limited by the bandwidth of the transceiver and channels must be in the same band and cannot be spaced too far apart. In this post we take a look at how it’s possible to run two separate GSM BTS instances with a single UmTRX. Which is to say, two independent base stations with only one UmTRX transceiver board, or commercial base station hardware that is based on this, such as the UmSITE product line. 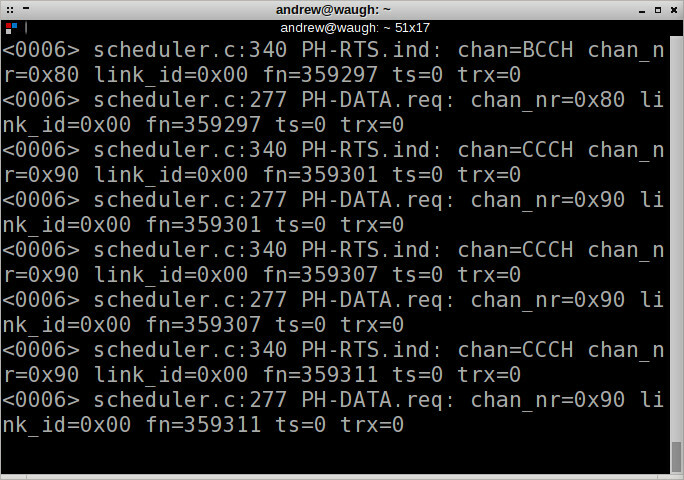 Note that while a single BTS together with UmTRX can also be configured to use both channels — i.e. as a BTS equipped with dual-TRX — this is different as there is only a single BTS instance, with both TRX configured for the same band and connecting to a common BSC and network. 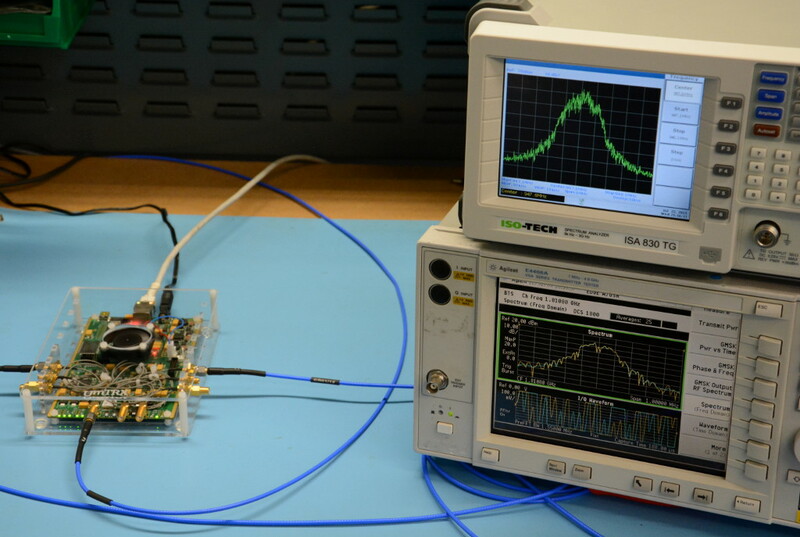 The hardware setup used in testing is quite simple, with a UmTRX connected to a HP Microserver running Ubuntu 14.04.2 and the Osmocom software. 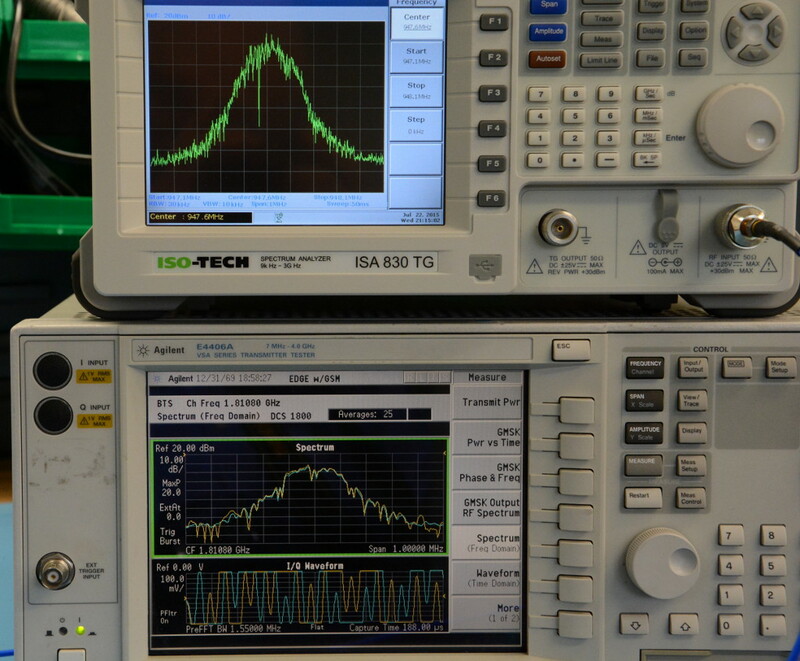 The TX ports for channels 1 and 2 were connected to an Agilent E4406A VSA Transmitter Tester and an ISO-TECH ISA 830 TG spectrum analyser. The UmTRX driver module can then be installed simply via “sudo make install”, else packaged as a Debian package via cpack. For more details see the Driver page. The Osmocom software is installed by cloning the sources, creating a build directory, entering this and running cmake, followed by configure and make etc. Rather than detail all these individual steps for each component in the software stack, just the required git branches along with any configuration options are noted here. See the linked wiki pages/sources for more details. The master development branch should be used for each. OpenBSC should be built from the fairwaves/master branch. Similarly, at the present time the achemeris/2sector branch of OsmoTRX must be used. Once the OsmoBTS and OsmoTRX code to support multi-BTS configurations has been tidied up, this functionality will be available via the fairwaves/master branches of each. The configuration used was based on the multi-BTS with handover example, with one major difference: each BTS instance must be configured to have only a single TRX, both in the OsmoBTS configurations and the OpenBSC NITB configuration sections for these. In our example it was decided to put BTS 0 on 1800MHz and BTS 1 on 900MHz. Note the use of different values for ipa unit-id. The OpenBSC NITB configuration (open-bsc.cfg) used was based on the multi-BTS one, with the main difference being to remove the trx 1 config sections from bts 0 and bts 1. The first BTS was put on ARFCN 540, which has a downlink at 1810.8MHz, with the second BTS on ARFCN 63, which has a downlink frequency of 947.6MHz. Followed by the first BTS. For obvious reasons each started with only one TRX. Next the transceiver was started with two channels. Note that the above screenshots were taken after everything had been started up. With our two BTS network started we could then see that we had carriers on the expected ARFCNs. So there we have it — you can now run two independent BTS instances with a single UmTRX board! Hi, I followed the steps but I got stuck on the second OsmoBTS software, I always get an error when trying to build it. Could you please provide some detailed steps concerning the second build. Also is it necessary to use the achemeris/2sector branch ? Hi Stanley, yes, you must use the achemeris/2sector branch for the 2nd OsmoBTS instance. The steps to build this are the same as for the 1st OsmoBTS, apart from the an alternate prefix specified with configure. If you’re still stuck if you could you please post more details of the error to the UmTRX mailing list. Should I download everything else one more time or only the osmo-bts application ? Which libosmo-abis branch are you using? Make sure that it is master and not fairwaves/master. HI, does multi-BTS work on the older UmTRX v2.1. Also I noticed that some tutorials use TRX_0 and TRX_1 for each BTS, does the UmTRX support two signals on the same channel ? Yes, I used v2.1 UmTRX hardware. Just be certain to be running the latest driver and firmware etc. With Multi-BTS you are limited to a a single TRX per BTS and this gives a total of 2x ARFCN. You cannot have a TRX0 and TRX1 with each BTS — this would not work. Of course, it may be theoretically possible to have a single UmTRX support 4x ARFCN (2 per TRX, provided that they are closely spaced and this can be “digitally tuned”). However, I’m not aware of anyone having done this and you’d likely have to hack the transceiver software yourself. Hi, both BTS are working fine right now. Thanks for this great tutorial. Hi, I also was able have the two channels working properly ! But I have a question concerning having two operators on a single system, how can we configure the system to give each BTS a certain MNC ? @David, that’s good to hear! @Stanley, good to hear that you are up and running also. 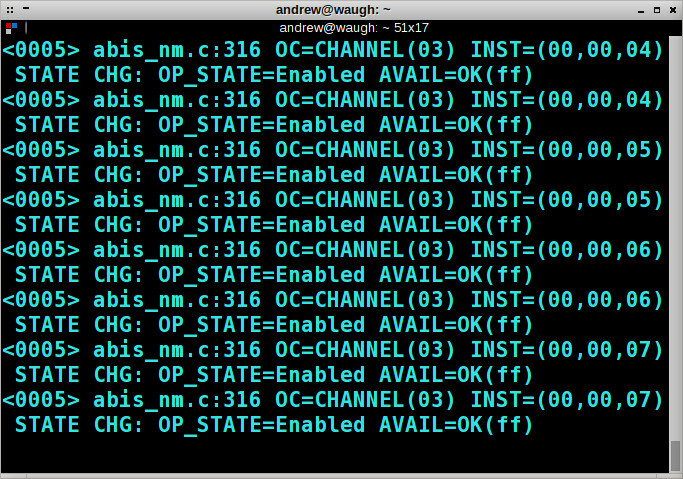 As far as I know, in order to run two seperate networks you would need to have two instances of OpenBSC NITB. The simplest way would be to put these on different hosts/VMs and configure each BTS to bind to a different IP. 1) Can the two instances of OpenBSC work on the same PC without VMs. 2) Can’t we change some code so that both BTS work using only one OpenBSC NITB ? 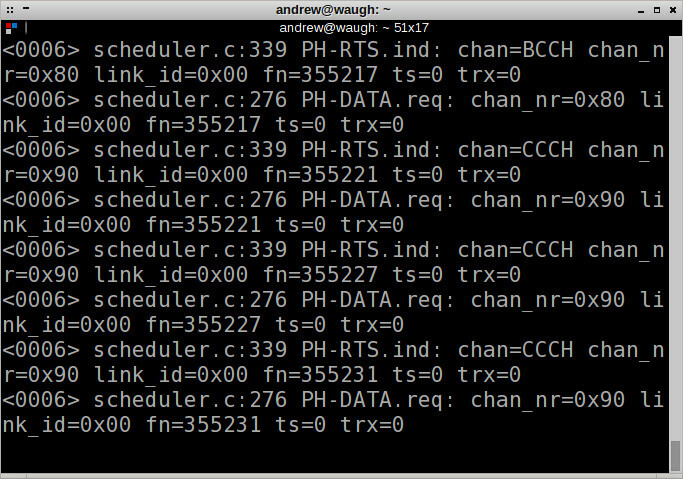 Hi, Is there a way to get the power transmitted or received by the MS such as the “chans” command in OpenBTS ? 1) You can’t do that without hacking the OpenBSC code – two instances will try to bind to the same ports and the second instance will fail. If you change the code to make ports configuratble, it will be a welcome change. Patches are welcome. 2) Theoretically you can, but it’s not a simple change. Use “show lchan summary” and related commands. I was wondering if it is possible to have two working BTS where each one has a specific group of subscribers that can connect to, for example one would be used by any subscriber while the other can only be used by people having some privileges. This is possible if you configure two OsmoNITB and connect each OsmoBTS to its own OsmoNITB. See comments above on how to do that. I’ve been trying to change some code in order to have the two BTS slightly different in terms of identity (different mnc, privileges …) but with no success. Can anyone guide me where should I be searching for the code to be changed ? I noticed that the MS will only be able to connect to the primary BTS, for example if I remove the antenna of BTS-1 I will still be able to find the BTS-2 when scanning with my phone, but when I try to connect, BTS-2 doesn’t receive anything (as if it was only sending but not receiving data). Is this normal or did I miss something ? Is there a bug or this is how it should work? Does the UmTRX v2.1 support two BTS simultaneously ? Only one seems to fully work while the second BTS only transmits without receiving (can’t register to it). Yes, both BTS should both receive and transmit. 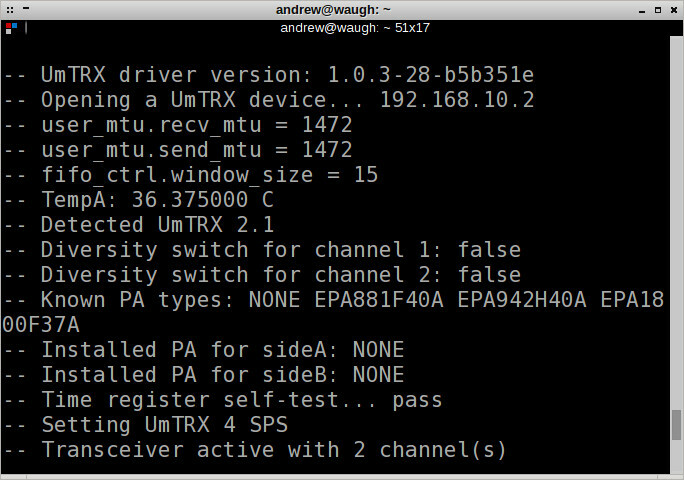 All versions of UmTRX have two independent receive and transmit channels. Is it normal that I can’t connect to the second BTS ? I installed all the libraries as mentioned in this blog, it seems that everything is working fine apart from not being able to connect to BTS1. Does this setup require some special hardware connections, or we should only connect an antenna for each TX/RX ? Did not work for me. Only one BTS working as it should. No special setup – just connect antennas you normally do. Ok, may be something got broken since I wrote the code. I’ll check when I get a chance (not very soon, unfortunately). Also everyone is welcome to help debug this and cleaning this up to include it into the master branch. I am willing to find what’s causing this problem, but I’m not sure if it’s caused by the BSC or the TRX side. Any suggestions ? Still wasn’t able to find anything, I’m working with ubuntu 14.10 on a VM, might this be causing any problem ? Do both TRX depend on the same oscillator? Maybe it’s a hardware issue. How can we have two RX working using GnuRadio ? was anyone able to have this setup working ? I couldn’t register my phone to BTS1 although it looks like its working, also no handover was possible. Is it a hardware problem? Has anyone been able to have it working yet ?